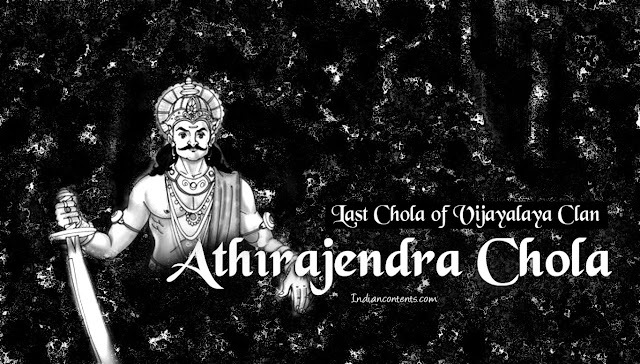 Athirajendra Chola was a Chola king who ruled for a very short period probably between 1067 - 1070 A.D. He succeeded his father Virarajendra Chola and became the king of great Chola empire which was once ruled by great kings like Karikala Chola, Vijayalaya Chola I, Aditya Chola I, Parantaka I, Rajaraja Chola I, Rajendra Chola I, Rajadhiraja Chola I etc. Athirajendra did not contribute much to the Chola empire as he ruled for a very short period. He died due to religious clashes in his kingdom probably. As we know that Rajaraja Chola gave his daughter Kundavai to Eastern Chalukyan king Vimaladitya and due to this Cholas and Eastern Chalukyas had very close relations. The Cholas regularly involved themselves in Eastern Chalukya empires succession matters and supported their favourite Chalukyan prince's. This led some serious troubles to Cholas in next generations. After the death of Virarajendra Chola, his son Athirajendra Chola succeeded him. Suddenly civil unrest arose in the kingdom and in those clashes died Athirajendra. After his death a Eastern Chalukyan prince Rajendra Chalukya captured the Chola throne, declared himself as the new king of Chola empire and assumed the title of Kulothunga Chola I. There were legends which claim that Kulothunga killed Athirajendra Chola to capture the throne of Chola empire.